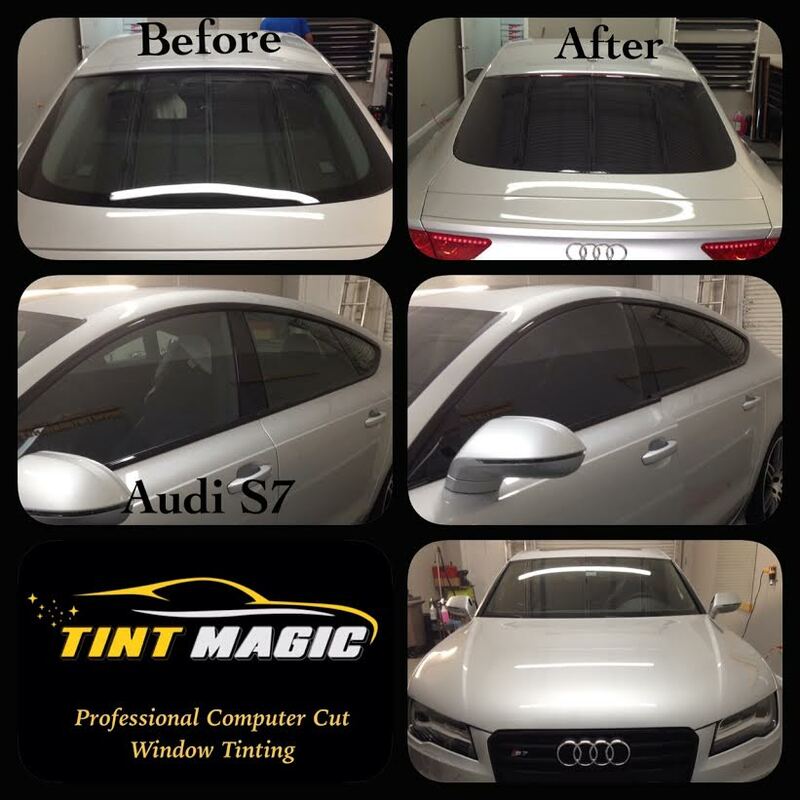 Audi S7 Window Tinting at Tint Magic Window Tinting Coral Springs,pictures before and after. Audi’s lineup of hatchbacked sedans is being refreshed for 2016. Having already driven the updated A7 and RS7, it’s time for us to focus on the model those cars bracket: the S7. It receives cosmetic and mechanical updates that seem minor but go a long way toward making a great car even better. On the outside, the current model’s boxy front fascia with its near-rectangular lower air intakes has been replaced by a treatment that’s just as sporty but more elegant. The new LED head- and taillamps of the A7 and RS7 are here, too, while the S-trademark quadruple exhaust pipes remain. Under the hood, the S7’s twin-turbocharged 4.0-liter V-8 has gone to the gym, muscling up from 420 horsepower to a nice, fat 450. Torque is unchanged, but 406 lb-ft should do the trick for just about anyone. If the engine sounds familiar, that’s because it spreads far and wide across the Audi lineup (as well as Bentley), finding a home in the engine bay of the S6 and RS7, among other models. But it has a different, less rowdy character here than in the RS car. The power is delivered forcefully, sure, but without the raucous bellow and rawness of the RS7. Its smooth and seamless character belies how quick this car is once you cane the thing, and the S7 charges easily up to a governed 155-mph top speed.